What comes after coffee and energy drinks? Caffeine sprinkles, of course! For centuries, coffee was the main delivery system for caffeine. Then, in the late 20th Century came Red Bull, followed by myriad energy drinks that brought that drug to teens and others who prefer sodas to brewed beans. Last year we wrote about caffeinated soaps, energy sprays, edible energy gels and a new chewing gum called Alert Energy Caffeine Gum which offers a boost of caffeine. And just a few months ago we featured smokable caffeine in the form of an eCigarettes called Energy Shisha. 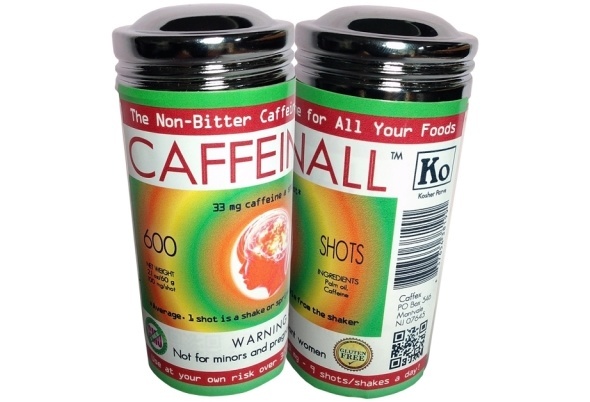 Now comes CaffeinAll, a product that you can sprinkle on food, just like salt, that adds caffeine to just about anything, from fish and fruits, to salad, pizza or ice cream. From a trends perspective, it seems like consumers cannot get enough of products that bestow energy to their eaters. Where will the energy trend take us next?